LAS VEGAS, Jan. 7, 2019 — (PRNewswire) — Sony Corporation ("Sony") will exhibit at the CES 2019 in Las Vegas, Nevada, held from Tuesday, January 8 (local time). Sony Corporation President & CEO Kenichiro Yoshida spoke at the Sony press conference held on Monday, January 7(local time), stating that "Sony is a Creative Entertainment Company. We at Sony partner with content creators who make the music, the movies, the television shows and the games that engage billions of eyes and ears and minds around the world. We'd like to showcase how Sony's professional grade technologies support creators across the entertainment industries to produce compelling content. You will also see how our consumer products connect creators and users by enabling people to enjoy content at the highest possible quality." He also introduced that "Communities of Interest," communities of people who share similar interests, emotional values and experiences, are formed around our world-class entertainment content and hardware products such as PlayStation® and α™ interchangeable-lens digital cameras. He closed by asserting that "with our technology, Sony is also there to deliver the very best entertainment experience to the fans and fill the world with emotions." Next to take the stage were Tom Rothman (Chairman, Motion Pictures Group, Sony Pictures Entertainment (SPE)) and Kristine Belson (President, Sony Pictures Animation, SPE). They spoke about how strong entertainment content and lasting IP are as crucial to fulfilling Sony's vision as outstanding technology. They went on to describe how Sony's technology and products help turn creators' vision into reality. They then introduced examples such as Sony's CineAlta Camera VENICE and α9 full-frame mirrorless camera that were used in the creation of TV shows and films. They also highlighted Sony's new TV lineup, including the BRAVIA® MASTER Series that adapts the creators' artistic intent and delivers content to users. Additionally, Rob Stringer (CEO, Sony Music Entertainment) took the stage and pointed to the "Lost In Music" brand campaign as an example of combining music and Sony's latest technology. He then introduced that Sony will deliver new music experiences to music fans with 360 (THREE SIXTY) Reality Audio. A video of the press conference can be streamed at the following website. The Sony booth consists of several zones such as "Visual Entertainment," "Music Entertainment" "α" and "PlayStation." Each zone introduces Sony's efforts and products that connect creators and users through the latest hardware and technology, and deliver the ultimate entertainment experience to customers. A stage has been set up in the center of the Sony booth. There, special talk show sessions and video screenings held several times per day will highlight the artistic intent of various content creators (including a Grammy Award-winning sound engineer, professional photographers, etc.). These shows will cover examples of creators' content made using Sony's latest products and their thoughts on the creative process. Click the link below for more information about the Sony booth and stage show schedule. The booth showcases the BRAVIA® MASTER Series' new lineup and shows off Sony's high picture and audio quality technology that faithfully delivers creators' intent directly to users. The BRAVIA MASTER Series Z9G (98"/85"), Sony's first 8K LCD TVs, feature the next-generation image processor X1™ Ultimate equipped with 8K ultra-resolution algorithm custom database, enabling the 8K X-Reality™ PRO to up-convert any content to 8K resolution. Additionally, Sony's unique and evolved Backlight Master Drive technology features a newly developed LED module and control algorithm optimized for 8K. The combination of these technologies brings high resolution and high contrast picture quality images to life in stunning fashion. Additionally, Acoustic Multi-Audio™ featuring four speakers located above and below the screen will make you believe the audio is coming right from the screen, achieving a high level of audio quality befitting the immersiveness of large-screen 8K images. The new flagship 4K OLED BRAVIA MASTER Series A9G (77"/65"/55") are approximately half1 the thickness of previous models when wall-mounted, seamlessly blending into any space. In addition to X1 Ultimate, it features unique Pixel Contrast Booster™ panel control technology, which faithfully reproduces everything from the deepest blacks to the highest luminosity colors with stunning vibrancy. Alongside Acoustic Surface™ Audio+ technology that produces sound from the screen itself harmonizing the image and audio for a cohesive and immersive high-quality surround-sound experience and Center Speaker Mode2, it is also compatible3 with Dolby Atmos®, the latest audio format. These TVs feature Netflix Calibrated Mode, which lets you enjoy a wide variety of entertainment from Netflix exactly the way the creators intended. 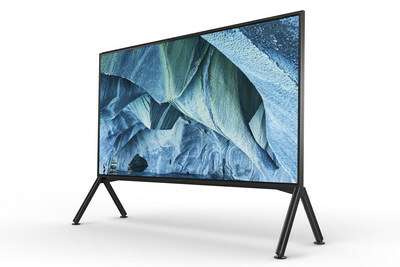 Additionally, these TVs are part of the IMAX® Enhanced certification program that is the result of collaboration between Sony's engineers together with IMAX, DTS® and content creators to faithfully deliver creators' vision and intent. 1: Distance from front of the screen to the wall as compared to A9F Series when combined with compatible wall-mount unit. 2: Must be combined with existing home theater system. 3: Requires network update. Update scheduled for within 2019. With the theme of co-creation between artists and Sony's technology, Sony introduces 360 Reality Audio, a new music experience which creates "sound fields" that make listeners feel as if they are immersed in sound from all directions. This new experience will bring users new ways to enjoy music, adding to the "rich sound quality" realized by High Resolution Audio (Hi-Res) and "superb audio functionality" as seen in our highly-acclaimed noise canceling. 360 Reality Audio is made possible through object-based spatial audio technology. It can add distance, angle, and other positional information to a sound source such as vocals, chorus, instruments, etc. to produce a three-dimensional sound field where the different sounds and musical elements can be projected from anywhere inside a 360-degree space around the listener. This creates a rich and immersive music experience that feels just like being at a live concert. Compatible content will be produced4 in collaboration with major music labels and is expected to be made available through music distribution services5. The booth also features a multi-speaker system composed of 13 speakers and a demo6 using MDR-Z7M2 headphones. A prototype display for a speaker system which delivers a 360 Reality Audio experience will also be on showcase. The display also features the Signature Series Hi-Res compatible audio product lineup, which harnesses Sony's high audio quality technology cultivated over many years, and last autumn's WH-1000XM3 wireless headphones which feature industry-leading7 noise canceling performance. 4: Sony plans to provide content production tools and publish the file format. The format uses open standard MPEG-H 3D audio, optimized for music streaming with the cooperation of Fraunhofer IIS, part of Europe's largest organization for applied research. 5: Service provision scheduled to begin on Deezer, nugs.net, Qobuz, and TIDAL, for a total of four services. 6: The demo first analyzes each individual listener's hearing characteristics to provide an immersive, optimized sound field. 7: As of August 30, 2018, according to research by Sony Corporation, measured using JEITA-compliant guidelines. In headband style of wireless noise cancelling headphones market. Responding to the artistic intent of photographers and film creators, Sony shows off the α9 and α7 series full-frame mirrorless camera, which allows for new imaging expressions, and a full array of custom designed mirrorless lenses including G Master™, along with professional photographic artwork. Additionally, with just one mount (E-mount), you can cover a diverse array of still and video cameras, and Sony is also expanding its product lines that can leverage a rich spectrum of custom designed lenses. On display are the α interchangeable-lens digital camera (compatible with E-mount lenses that support full-frame and APS-C size image sensors), XDCAM™ memory camcorder, and a professional cinematic camera, CineAlta VENICE .